The Oregon Trail ended at Oregon City, which became the first incorporated town in Oregon. The town built up around a cluster of mills that used waterpower from the mighty falls on the Willamette River. By the 1880’s, the nearby town of Portland had grown into a major port city and needed a source of power for street lighting and electric railways. 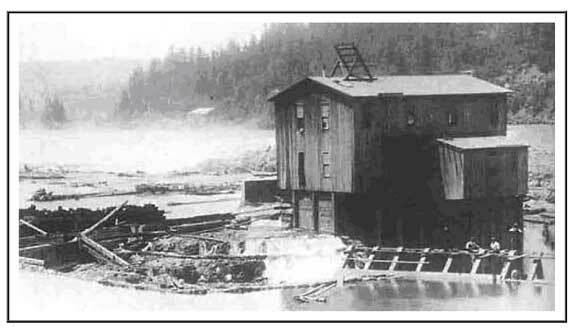 In 1889, a group of local entrepreneurs built the first AC hydroelectric plant in the United States at Willamette Falls and transmitted the power 16 miles to Portland at 4000 Volts potential. This 1890 photo of the plant was taken from Mike Parker’s story in Power Line Explorer Journal, Vol. 3, No. 1. Experience with telegraph lines had led electricians of the day to believe that high voltage transmission would be limited by electrical leakage over the surface of a wet insulator. 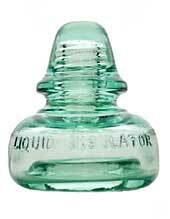 The Willamette Falls line used a CD 180 Liquid Insulator, which had an internal oil cup. It was believed that an oil surface would interrupt the leakage path from tie-wire to pin over the glass surface. The 1904 Electrical World drawing below shows how the oil cup was used.